How’s a Player Reactivators’s workday? You will work at the main office in Malta with several other colleagues from all Nordic countries. Here you will be providing customer support and player re-activation tasks for the major iGaming ventures across Europe. Basically, this means that you will be answering incoming calls and assisting the iGaming companies customers with support issues. The biggest part, however, is to contact various Finnish customers at the different Internet casinos and offer them great reactivation offers if they start playing at the specific casino. You will be promoting the latest online casino games and bonus offers with passion. The company is young and active, employees are taken well care of and are involved in after work activities to get in touch with the big Finnish and Nordic community in Malta (10.000+ people). This is an excellent opportunity for a person who has worked with sales, customer service or likewise to start a career within iGaming. Who is our new Player Reactivator? If you are a social person with a great personal drive and the ability to convince others, this job has your name written all over it. Malta in general and iGaming, in particular, are fast-paced environments with many social encounters and bursting cultural life as well as a swelling entertainment life. If you got a mindset for success and not afraid to try new things in life, then welcome on board! Join the successful team and start the adventure of your life. Fast internal promotion is common, you probably wouldn’t find a better place to start your career. Malta is a small island nation in the Mediterranean Sea just south of the Island of Sicily. The island is bursting with culture and is considered the world’s iGaming hub. In Malta, you will get 305 sunny days a year and it has been praised by Newsweek for having the best climate in the world. In addition to this, you will find great price levels, low taxes and lots of entertainment. Malta is a secure country to settle down in with one of the lowest crime rates in Europe and state-of-the-art medical care. Airfare ticket, airport transfer and accommodation are included. The salary is divided into a guaranteed part (a normal Maltese monthly salary) and a greater commission part. The standard employee earns €2.500 per month even if some earn up to €4.000. 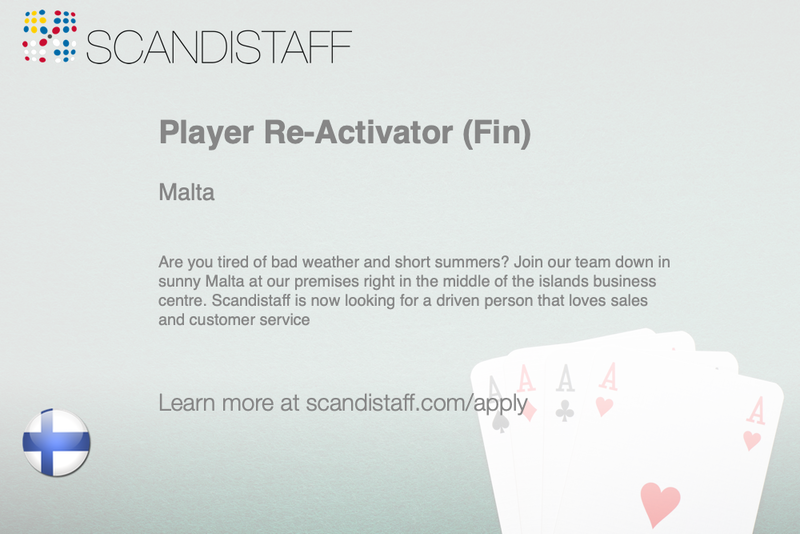 Do you want to be the Player Reactivator? ?